Entryways can be tricky and often times are overlooked. Believe it or not, it is still possible to have a stunning entryway when there’s constantly mud and grass being tracked in. With a few unique ideas, your cluttered entryway will become a cute and functional invitation into your home! 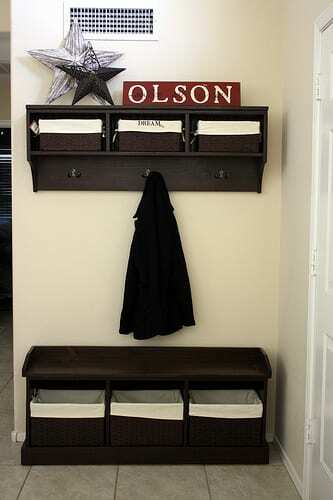 Do you want a simple, clean entryway that stores away all of your unwanted clutter? For a simple, functional entryway, Melissa provides a step-by-step tutorial that is simple and easy to understand. Even though your house may not exactly have an entryway, it doesn’t mean you can’t create one. 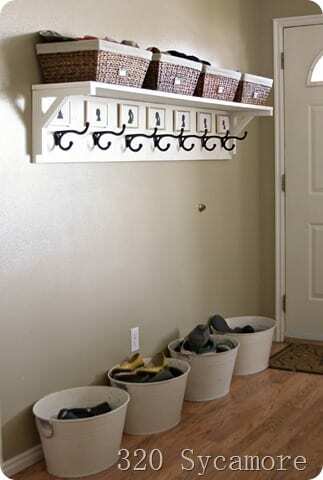 Each family member can have their own bin, basket, and hook allowing for organization. This option provides the ability to personalize with pictures to go along with each hook. It is simple and clean cut–perfect for any family! Are you interested in creating an organic-chic rack that’s simple and can hold your jackets, bags, and more? This simple idea can be made from driftwood and only a few hooks! If you’re interested, Design Sponge provides easy to understand directions that will give you the look that you want! With the driftwood adding an earthy touch, allows for an earthy touch for a simple design. Not only is it cute, but it’s functional! If you’re looking to add more storage, you can have a sitting bench, with bins underneath to store shoes and other necessities. This entryway is organically chic, which is perfect for any style home! Do you have a coat closet that tends to get unorganized and seems useless? Guess again! The House of Smiths once thought that about their cluttered coat closet. It is amazing how a single closet transformation can change your entryway and become more useful for your entire family! A two door closet can also be transformed into an entryway like this. A built-in bench is the perfect spot for taking off your shoes after a long day at work or at school. Having a bin and hook for each member of the family, or for different things can provide the proper organization that your family is looking for. No more searching for gloves, hats, or other outerwear. There is a proper spot for everything, which will allow you to get out of the door faster! Elsie and Emma created a unique, rustic way to store everything you need year round–from boots to gardening tools. 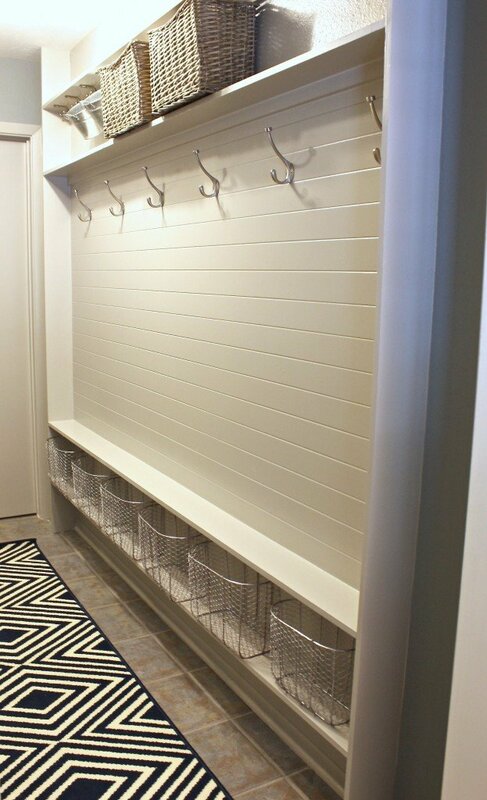 Using crates, boards and hooks, your entryway will be transformed! Believe it or not, crates do not just hold apples; by turning them on their sides allows for the proper storage you are looking for! From books, to shoes, to plants, you can store about anything in the crates. The wood planks create the rustic edge, but can be shared in any home. Why not pair photos with it to personalize it? An entryway like this will spice up your home, creating a very warm, welcoming invitation. Does your home follow a very clean, classy style? If so, check out Ana White for a step-by-step tutorial, including tools, wood measurements, and diagrams. The simplicity of this entryway is an eye catcher that you can even personalize! Even though this picture shows dark stained wood, it can be any other stain or color you desire! With a lighter color wall, dark stained wood was perfectly paired creating a wonderful contrast. On the top shelf, you are able to personalize it with your last name, different decorations, or photographs. Bins can hold all of your seasonal necessities, that are all in arm’s reach. Hooks provide the proper storage for your coats, so you’re not leaving them on the floor or over the kitchen chair. The perfect entryway that can be personalized just for your family! Who needs would on the floors, when you can use it as an accent? Bring the outdoors in, with a plank wall, which allows a warm environment for your guests to enter. Hooks to hang your coats on, allows organization to avoid a cluttered mess. Don’t forget pictures of your friends and family for your final touch! I love this entryway because it’s a different design than most. It is clean, warm, and allows for the perfect place to take off your work boots on the bench, hang up your coat, and relax for the rest of the night. Different photo frames allow for texture within the design; you can even spice it up with colored accent pillows. Please visit Whitney’s page to see how she achieved this wonderful idea step-by-step! 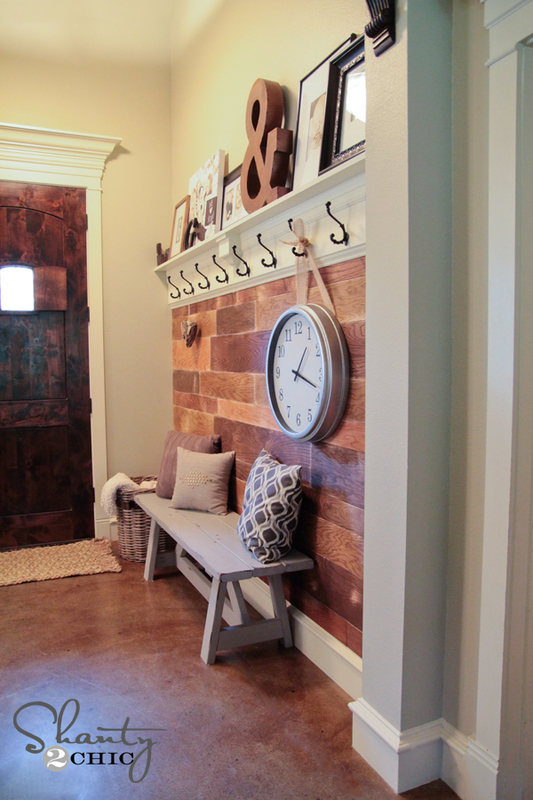 Staci from ‘Random Sweetness,’ used reclaimed wood to achieve this rustic entryway bench. 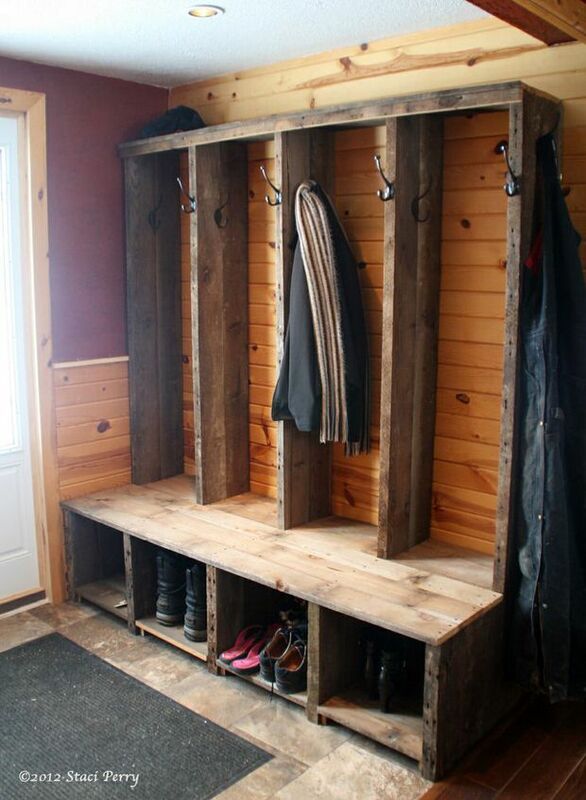 What a beautiful, rustic place to store your coats, boots, and a place to sit and do it all! Just simply add a few pictures to personalize it! This would can be rustic or clean cut, depending on the stain or color you decide to use. Either way, it is functional with the perfect organization. It allows for enough room to store multiple shoes and coats. You can accent it with accent pillows, pictures and more! This is a blank canvas for your creative mind, because the options are limitless! ‘The House Of Smiths’ came up with a beautiful idea if you’re just looking for a cute, decorative spot to drop your keys off. 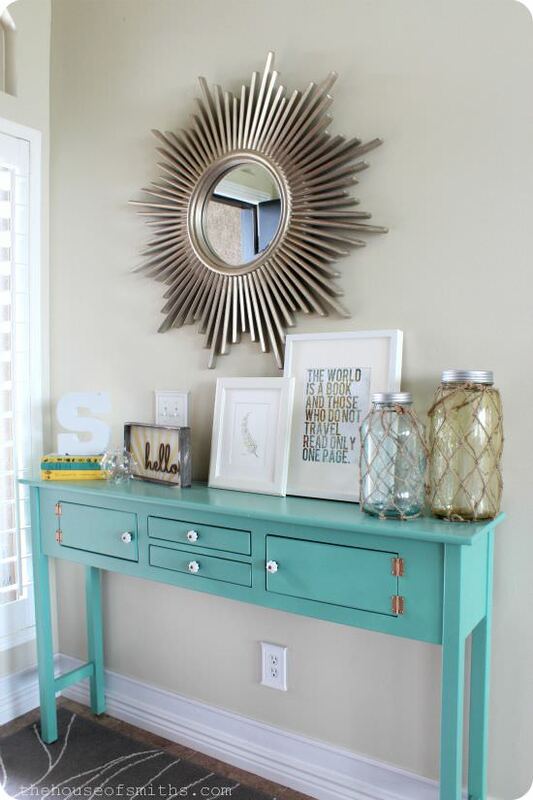 With a bright colored table, paired with decorative jars, quotes, and a sunburst mirror, it adds life to your entryway. Your guests will definitely look twice before they walk by! If you don’t necessarily need an entryway, but can tell that your entryway is lacking something special? Why not have a cute area that can hold your keys, papers and any miscellaneous things? Or a table that invites your guests in with a personal touch, sharing pictures of your closest friends and family? A bright colored table invites your guests in, with possible storage and cute accessories! A feminine style that can be easily changed for your personal liking. Are you wondering how you can still have an entryway if you might necessarily not have enough room? Yes you can! Cyndy came up with a creative solution. With only having 5 inches to work with, creativity came into play! With using boards, baskets and hooks, it provides storage for all of your on-the-go necessities with easy access! Some homes may not allow for an entryway that you would usually think of. Even if you might necessarily have the space, who says you can’t create it? This specific idea is a blank canvas, allowing for your colorful thoughts to explode! From colors to pictures, the options are endless. This entryway allows room for your seasonal outerwear, coats, shoes, and more. Anything is possible with a creative mind! With your kids being back to school, could allow for a cluttered mess that is hard to easily function. 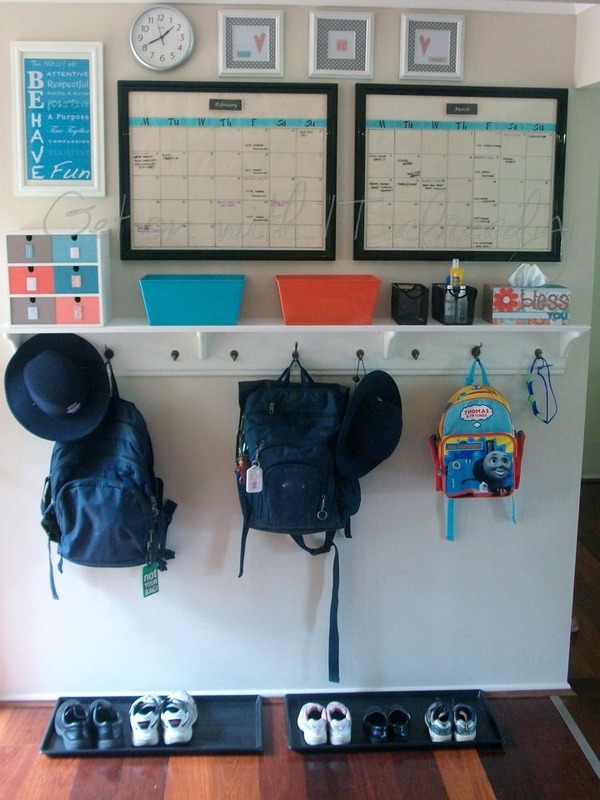 Weekday mornings simply become easier with just adding a few hooks for your kids to hang everything up, a calendar to organize all of your plans through out the month, and a mat for all of your dirty shoes. Of course we can’t forget the adults! Losing your keys become very easy as you’re running about your day; using organization bins simply solves that! ‘All Parenting’ provides awesome ideas to keep your families life organized and fun! A busy schedule and kids, things may get hectic, but anything can be controlled and organized. In this entryway, everything has it’s own place. Your children will know exactly where to look for things and know what is going on in their week so there is no confusion. Life just became a little easier!